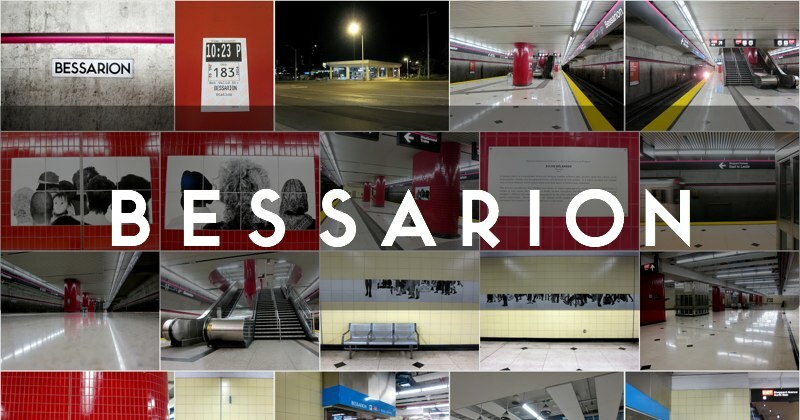 I got kicked out of Bessarion station—for taking these photographs. It likely won’t be the last time this happens, but it was still the first time it happened to me. The cavernous station, opened in 2002 as part of the Sheppard line, is renowned for its low traffic and mausoleum-like quality. During my visit, the station was deserted as usual, which made my ejection all the more entertaining. Like others who have made the pilgrimage to Bessarion, I was struck by the station’s emptiness and gross over-capacity. It seems to be primed and waiting in anticipation of vast crowds which have never materialized. Columns decorated with Sylvie Bélanger’s Passing. The featured artwork at the station is Passing, by Sylvie Bélanger. It purports to ‘capture the memory of the people who have used the station in the past and anticipates those who will use it in the future’. Given the station’s abysmally low usage, Belanger’s friezes depicting masses of commuters seem deliberately ironic. Perhaps one day, new development in the neighbourhood will boost ridership volumes to match Belanger’s vision. Until then, Bessarion has to be considered as an ode to the poor resource allocation that occurs when politics interferes with sound transit planning. I had more or less finished my tour of the station, and had exited the fare zone on the Concourse, when the lone(ly) collector in the booth began to shout at me. ‘No photos on TTC property!’ he yelled. 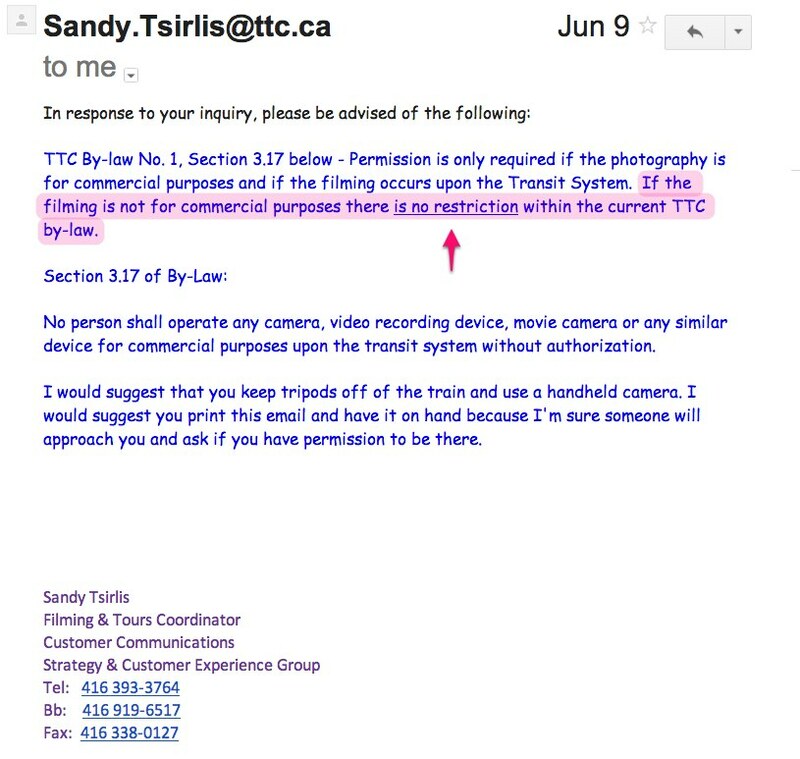 No person shall operate any camera, video recording device, movie camera or any similar device for commercial purposes upon the transit system without authorization. I explained patiently that my photographs were for a personal, non-commercial project, and were therefore permitted. I also explained that the station featured artwork and designs which were of general public interest. Lastly, I showed him the correspondence I received from the TTC Film office, which states clearly that permission for non-commercial photography is not required. The collector brusquely told me that he did not care about my papers, and that I was not allowed to photograph within the station. He then called (or pretended to call) for a Transit Enforcement Officer. I calmly explained to the collector he was misinformed, and then took a photograph of the TTC Public Notice posted beside the fare collection booth (it’s the one on treating people with Respect and Dignity. It also has the bylaw I’m quoting above). This upset the fellow tremendously. He flew out from the booth, crossed the turnstiles, and approached me. He positioned himself directly in front of me, impeding my progress. He loudly berated me for taking photographs on TTC property. He then ordered me to leave. His manner was obstreperous, and belligerent — and out of keeping with the friendly attitude I would expect from a front-line TTC employee dealing with customers. Of course, the bar is set pretty low with respect to Collector skill requirements, so I suppose I shouldn’t complain. The man grew apoplectic, and seemed at risk of losing his self-control — so I left the station, as instructed. I don’t appreciate being shouted at, and I find discourteous behaviour unacceptable. I simply returned to the station the next morning, and took the remaining photographs I wanted (the morning-shift fare collector had no problems with my taking as many photographs as I wanted). I’ve subsequently reflected about the incident, and while I’m not happy about the collector’s behaviour, I’d like to speculate on the larger context which makes it... understandable though still incorrect. I considered contacting the Group Station Manager for the area, but decided it wasn’t worth the bother. Now imagine you take someone like that, and stick them in a small, isolated glass-enclosed box, for 8 hour shifts, day after day after day. Trapped there, killing time, monitoring an empty station where nothing ever happens and hardly anyone even uses the place. Do you remember The Shining? So it doesn’t surprise me that the collector, bored out of his skull, would greedily seize upon any chance, any opportunity to wield his powers over a presumed miscreant and rule-flouter. Psychologically it’s a coping mechanism to compensate for the powerful, all-encompassing isolation of being posted there. It’s about control, and trying to exercise it. At least, that’s my theory. This post is dedicated to TTC employee 52711: Calm down, and be nicer to customers. It goes a long way, a lot further than frothing, inaccurate bluster. You have discretion and judgment at your command. Use it. Have you ever been kicked out of a TTC station? Tell me about it in the comments! * Happily, Andy Byford, the TTC CEO, plans to reform the fare-collector role to allow for greater responsibility within the stations. Also, I’m not suggesting that all booth collectors are indolent misanthropes, just that it’s not always a prime position where star employees wind up. At least, not at Bessarion during the evening shift, in 2014. In fairness to the collector, many TTC employees have been trained with the idea of ‘no photos on the TTC’. That’s what some have been told is the policy by management. So being questioned is not an issue. My beef is with his aggressive rudeness and unwillingness to understand or acknowledge that the official policy (printed on the side of the wall beside his booth!) is different. I expect civility from a civil servant—is that too much to ask?